On March 20, 2003, a large force of United States and British troops invaded Iraq, leading to the collapse of the Iraqi government in about three weeks. Ground forces from Australia and Poland and naval forces from Denmark and Spain also took part. The international community was divided on the legitimacy of this invasion; see worldwide government positions on war on Iraq. Casualties of the invading forces were limited, while Iraq military casualties are unknown, probably at least in the thousands, and Iraq civilian casualties are also unknown, most likely on the order of 1,000. The U.S. Third Division moved westward and then northward through the desert toward Baghdad, while a U.S. Marine division and a U.K. expeditionary force moved northward through marshland. U.K. forces secured Iraq's second-largest city, Basra, following two weeks of conflict, although their control of the city was limited. Preexisting electrical and water shortages continued through the conflict and looting began as Iraqi forces collapsed. While British forces began working with local Iraqi Police to enforce order, humanitarian aid began to arrive from ships landing in the port city of Umm Qasr and trucks entering the country through Kuwait. Three weeks into the invasion U.S. forces moved into Baghdad with limited resistance, Iraqi government officials either disappearing or conceding defeat. Looting, including looting of the National Museum of Iraq, took place in the days following. The F.B.I. was soon called into Iraq to track down the stolen items. Coalition forces, with help from the local Iraqi Police officers, quickly began to make efforts to control the looting. Historians say many artifacts and documents about the old Sumerian time may be lost forever as a result of looting of the National Museum, which, unlike the Iraqi Ministry of Oil and the Ministry of Interior, wasn't one of the two buildings protected by U.S. forces against looters. Following the September 11, 2001 Terrorist Attack, the George W. Bush administration declared a War on Terrorism, accompanied by the doctrine of preemptive military action dubbed the Bush doctrine. In 2002 the Iraq disarmament crisis arose primarily as a diplomatic situation, with United Nations actions regarding Iraq culminating in the passage of UN Security Council Resolution 1441 and the resumption of weapons inspections. The United States also began preparations for an invasion of Iraq, with a host of diplomatic, public relations and military preparations. No such weapons have been reported as found as of April 24, 2003, though Saddam's government collapsed, former Palestine Liberation Front leader Abu Abbas was captured, and the oil fields and resources were rapidly secured. The U.S.-led coalition against Iraq is claimed by the Bush administration to include 49 nations, a group that is frequently referred to as the "coalition of the willing". The only known combat forces are from the United States, Britain, Australia, Denmark, and Poland. Ten other countries are known to have offered small numbers of noncombat forces, mostly either medical teams and specialists in decontamination. Popular opposition to war on Iraq led to global protests, and the war was been criticized by Belgium, Russia, France, China, Germany, and the Arab League. Several nations, including Austria, say the attack violates international law as a war of aggression since it lacks the validity of a U.N. Security Council resolution that could authorize military force. The Egyptian former United Nations Secretary General Boutros Boutros-Ghali has called the intervention a violation of the UN charter. The United States and Britain maintain it is a legal action which they are within their rights to undertake. Along with Poland and Australia, the invasion is supported by the governments of several European nations, including the Czech Republic, Denmark, Portugal, Italy, Hungary, and Spain. This campaign has featured a variety of new and weighted terminology, much coined the U.S. government and then repeated by the media. 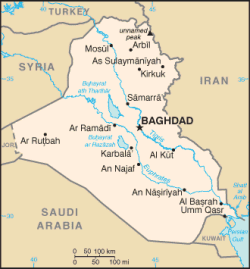 The name "Operation Iraqi Freedom", for example, expresses one viewpoint of the purpose of the invasion. Also notable was the exclusive usage of "regime" to refer to the Saddam Hussein government (see also regime change), and "death squads" to refer to fedayeen paramilitary forces. Another difference was the wide and independent coverage in the World Wide Web demonstrating that the internet has become mature as an medium, giving everyone access to different versions of the truth.